Willy Care Kit - Moar Stuff - You don't need it but you know you want it. Gifts for MenJokes & Gag GiftsWTF? 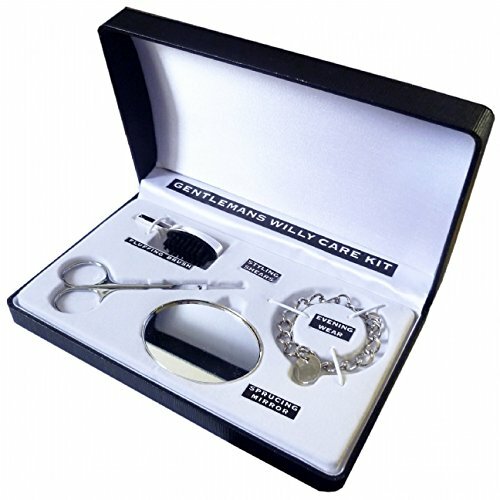 The Willy Care Kit is an extremely funny grooming set for the man who has everything! He may spend hours gelling his hair and using his ‘man-products’, but how long does he really spend making sure his crown jewels are kept in mint condition?! After a quick spit and polish with the Willy Care Kit, he’ll feel like a criminal keeping it under wraps! The Willy Care Kit will guarantee every part of your man looks sharp (perhaps this is a bad choice of words!) and tidy. He’ll be glancing smug in the Sprucing Mirror, shearing his hair into perfect shape with the Styling Shears, fluffing ’til he can fluff no more with the Fluffing Brush, and donning his ding-dong with the elegant Evening Wear Willy Chain! The Willy Chain is so shiny and sparkly that it will seem a damn shame to keep it hidden in your tuxedo trousers. But do that. I know at the last (and I mean THE last) fancy dinner party I went to, I decided to allow the bracelet (and my business) free range to show off the dynamic facets and diamond(ette) studded glory that made me feel like a man of wealth and taste. Needless to say, I spent the night in the local constabulary. While there, I met Pedro and Chester. They were not nearly as impressed with my manhood’s come-hither attitude as I had hoped. The Willy Care Kit makes for a super stocking filler, secret santa or even Birthday gift! If your man likes to pamper and groom himself, then this is the novelty gift for him! Dimensions: 7.1 x 1.2 x 4.3 inches. Not just for guys named Willy!!! Warning: Over-fluffing may result in unexpected but pleasurable swelling.